EWG scientists reviewed Ethique Butter Block, Sweet Orange & Vanilla for safety according to the methodology outlined in our Skin Deep Cosmetics Database. We assess the ingredients listed on the labels of personal care products based on data in toxicity and regulatory databases, government and health agency assessments and the open scientific literature. 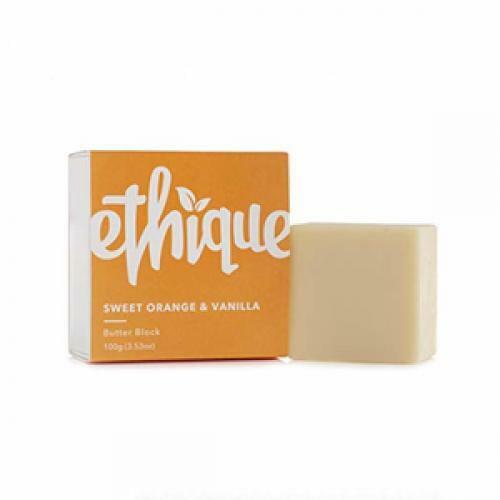 EWG's rating for Ethique Butter Block, Sweet Orange & Vanilla is 2. Caprylic/capric triglyceride, stearic acid, cetyl alcohol, Theobroma cacao (coca) butter, Orbignya oleifera (babassu) seed oil, stearyl alcohol, Tapioca starch polymethylsilsesquioxane, lecithin, sodium lactate, undecane, tridecane, Vanilla planifolia (vanilla) oil, Citrus sinensis (sweet orange) essential oil, benzyl alcohol, dehydroacetic acid, citral, limonene, linalool. Best used on damp skin when straight out of a shower or bath. Simply swipe the bat down the area to be moisturised (use less than you think you need) and rub in. Enjoy! This product may soften or melt in transit over the summer months. If so, please pop in the fridge for 3-4 hours upon arrival for it to harden up.